This guide will show you how to test and replace the radiator fan assembly or radiator fan motor in the Honda Element. Thankfully, the Element has serviceable fan motors -- meaning that you can remove and replace a fan motor without replacing the entire fan assembly. Note: the left and right fan motors are not the same. However, the left and right assemblies are the same. So if you're replacing the motor only, be sure to grab the correct one -- if you're replacing the entire assembly, there's no need to worry. 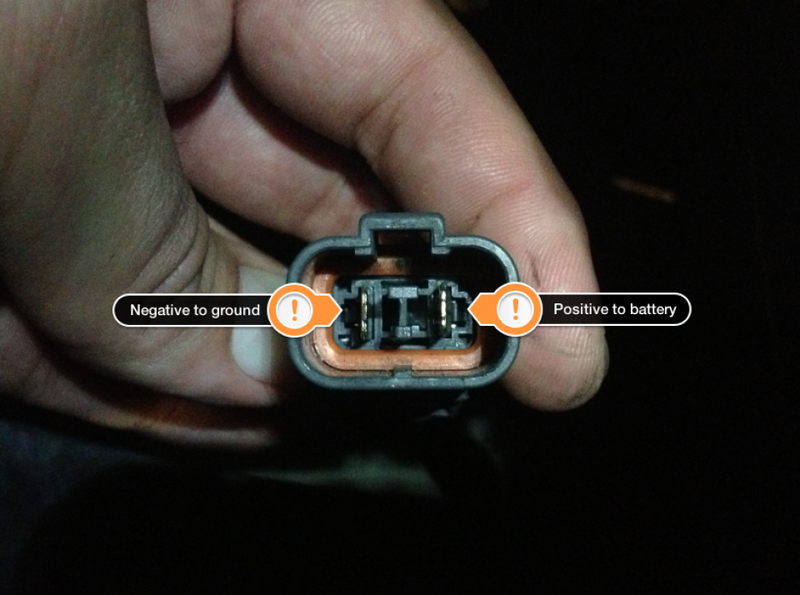 Make two jumper wires and connect them to the positive terminal and ground respectively, as shown in the attached photo. You can use two female quick-disconnect connectors to make the process easier. If the fan doesn't move at all or barely moves, the motor is bad. Make sure the car is cool before you get to work. Using a flathead screwdriver, remove the plastic rivets and large upper plastic trim piece. 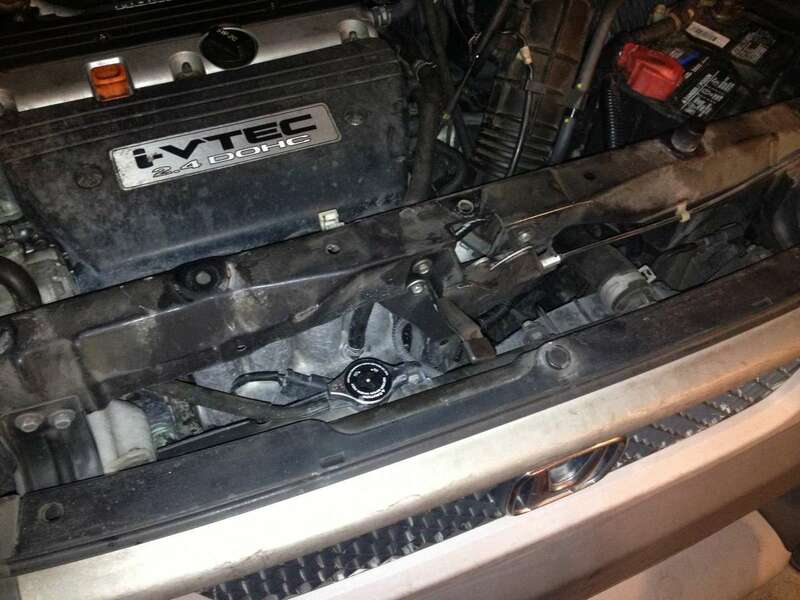 This is the piece that surrounds your hood latch and is located directly above the radiator. Locate the plastic wiring harness rivets and squeeze them to put the wiring out of the metal crossbar (which we will remove next). There are 4 plastic rivets on the top of the cross support and several on the "T" portion of the cross support. 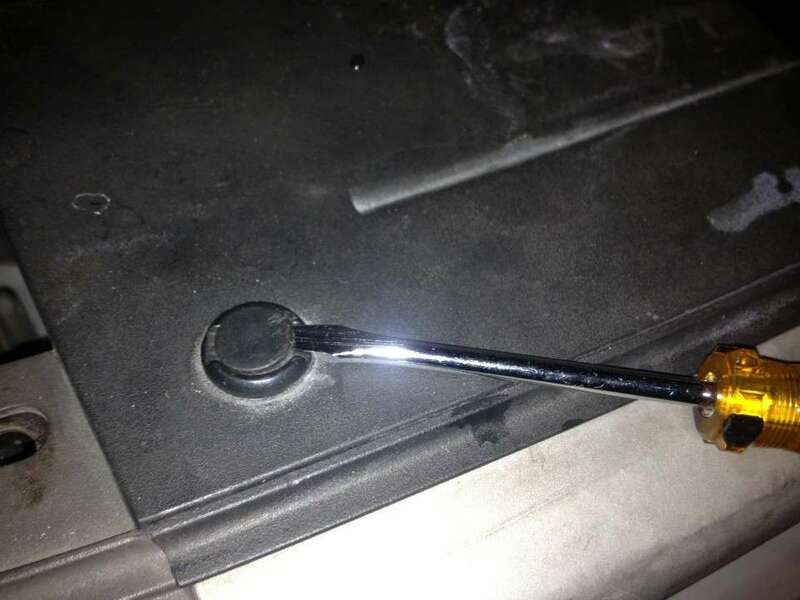 Using your socket wrench and a 10mm socket, remove the four cross bar bolts. There are two on each side (see photo). There's a bottom cross support bolt at the other end of the "T" that connects to the cross support. Once this bolt is removed, you can fold the entire cross support out of the way. 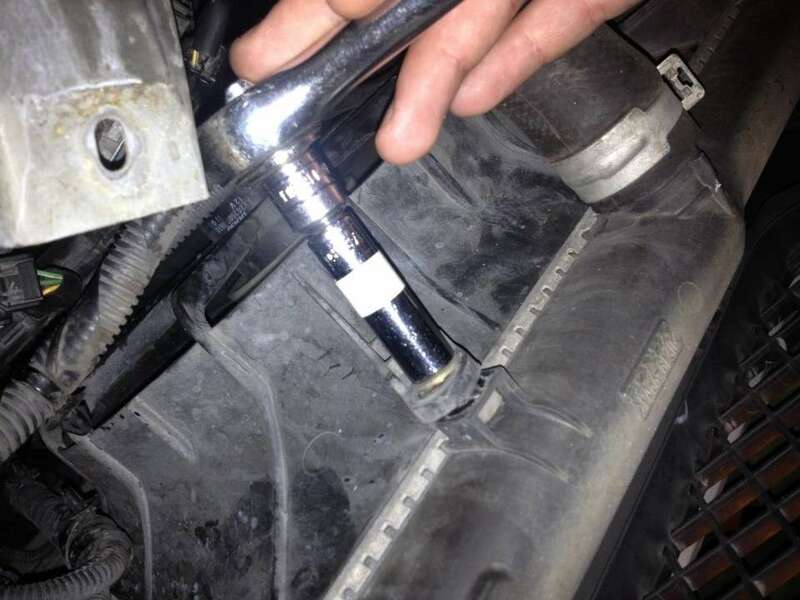 You can access this 10mm bolt from beneath the car. You may need to remove the plastic splash guard from beneath the guard depending on your hand/arm dexterity in order to get to this bolt. 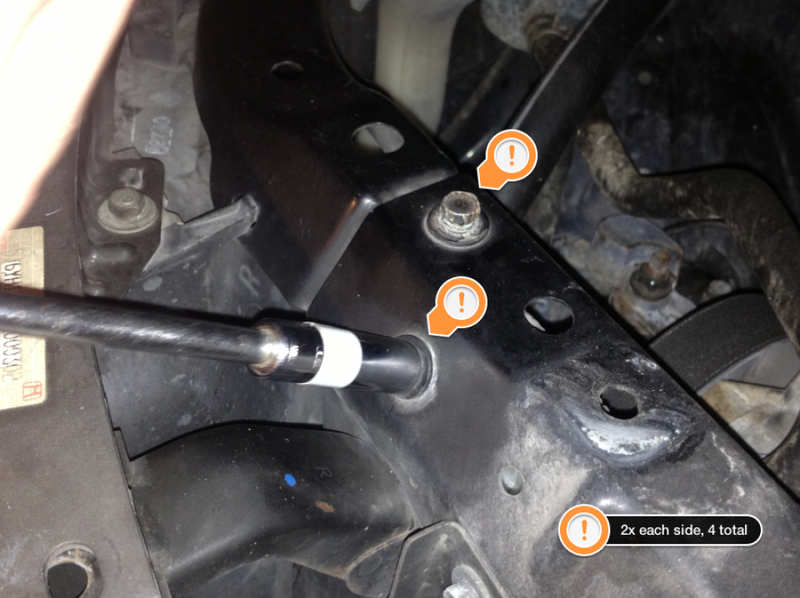 You can leave the hood release cable and radiator brackets attached to the cross support. Flip it up towards the windshield to get it out of the way. You may need to remove the hood release cable's plastic rivets to make it easier. Each radiator fan has two 10mm bolts and an electrical connector. Remove these. 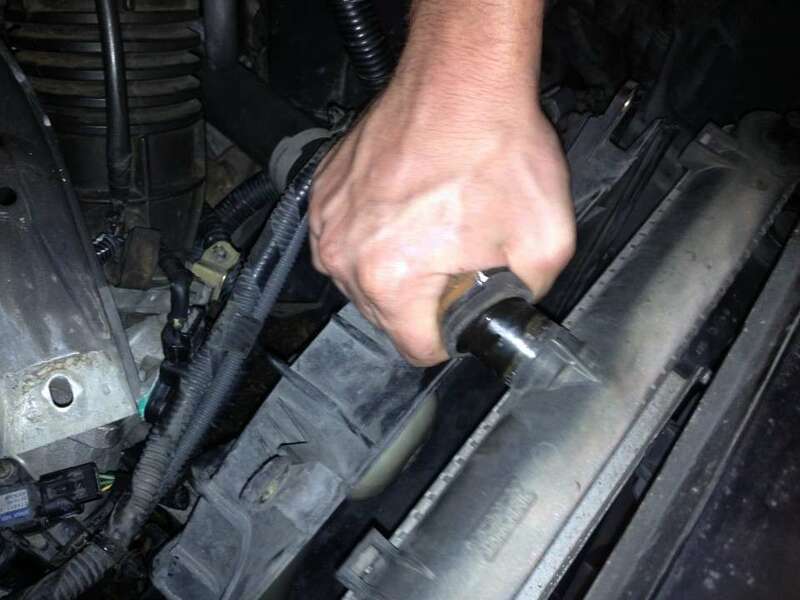 The upper radiator hose is in the way of removing the drivers-side fan. 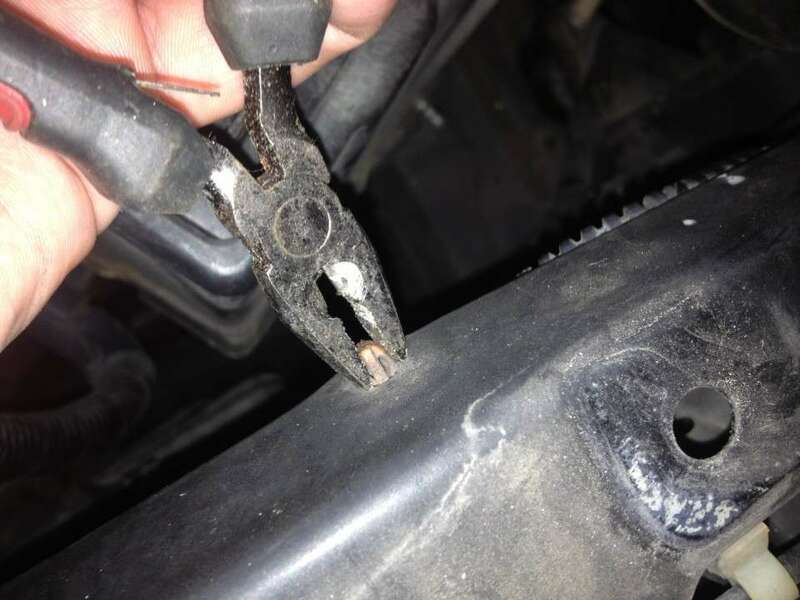 Use a pair of pliers to remove the upper radiator hose clamp and pull the hose off. 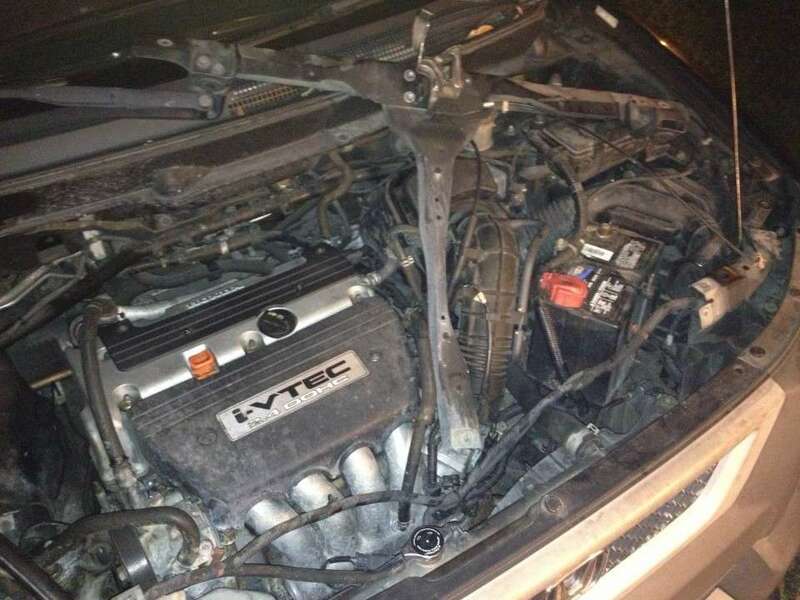 There won't be much coolant sitting in this hose but some will spill out of the radiator. With this hose out of the way, you can remove the defective fan assembly. Engine coolant is tasty and extremely deadly to pets. Leave Fido inside. 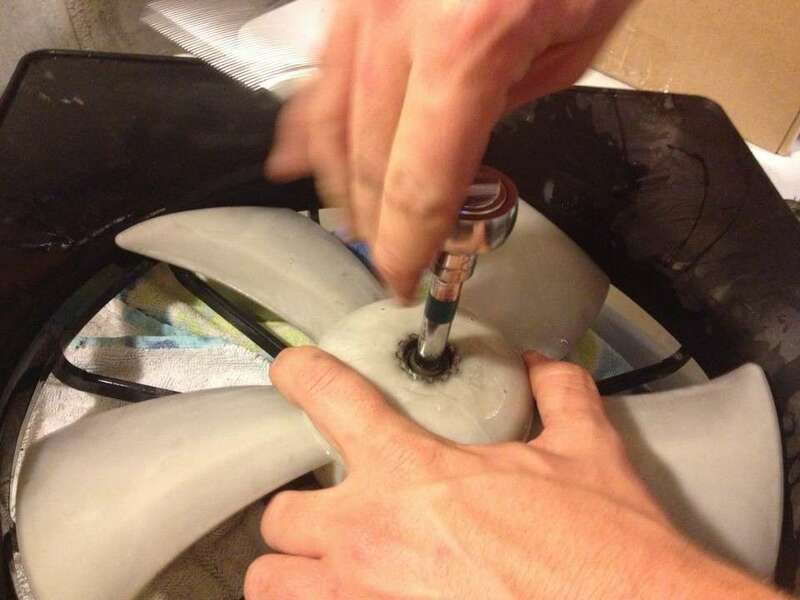 If you're replacing the fan motor itself, follow this step (and the next few). If you're replacing the entire fan assembly, you can skip these. To remove the fan assembly blade, hold the blade and turn the nut on the end of the blade using an 8mm socket. The fan blade bolt is regular-thread, not reverse-thread. Using a phillips-head screwdriver, remove the three screws holding the old motor in place. Be careful not to strip these screws -- mine were already stripped when I opened the thing up. As always, reassembly is the reverse of disassembly. Reassembly only took a few minutes with the proper equipment -- including a buddy and a 6-pack! This guide shows you how to replace your window motor/regulator assembly should your window fall down and refuse to roll back up.